The Mini Wooden Pedalboard 1 is a maple-built two rail guitar effects board designed for on-the-go musicians that need a way to keep all of their pedals in place. This is the answer for musicians who are exploring their hardware and tone. The sturdy, lightweight wooden design makes this pedal board road ready for any size gig. The unique curved board design allows for plenty of space to store your excess cables underneath. This board is wide enough to accommodate both regular and mini pedals while also holding your volume or wah pedals. A fitted, padded soft case with double handle, shoulder strap and accessory pocket gives you protection on the go. Inspire your music with the CNZ Audio Wooden Pedalboard 1! 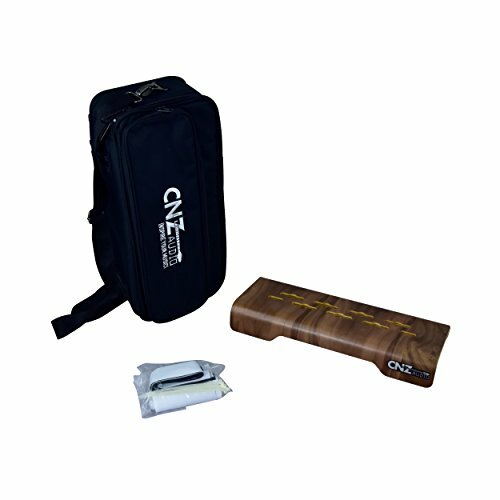 The CNZ Audio Mini Wooden Pedalboard is a made from Maple wood and is designed for on-the-go musicians that need a way to keep all of their pedals in place. This is the answer for musicians who are exploring their hardware and tone. The board is 15.25IN wide by 6.25IN deep and 2.25IN in height. This is equivalent to a deep 2 rail board and can accommodate both regular and mini pedals while also holding your volume or wah pedals. The uniquely slotted holes provide room to connect power connectors and most straight or right angle connectors to tun under the board to maximize space and cleanliness on top of the board. Some pancake style connectors may not fit through the holes. A fitted soft case with extra thick padding, double handle, shoulder strap and accessory pocket gives you protection on the go for all of your pedals. The accessory pocket provides room for an extra power supply, picks, capos, pedal, instrument cable or other road gear. Inspire your music with the CNZ Audio!